All Americans from sea to shining sea. 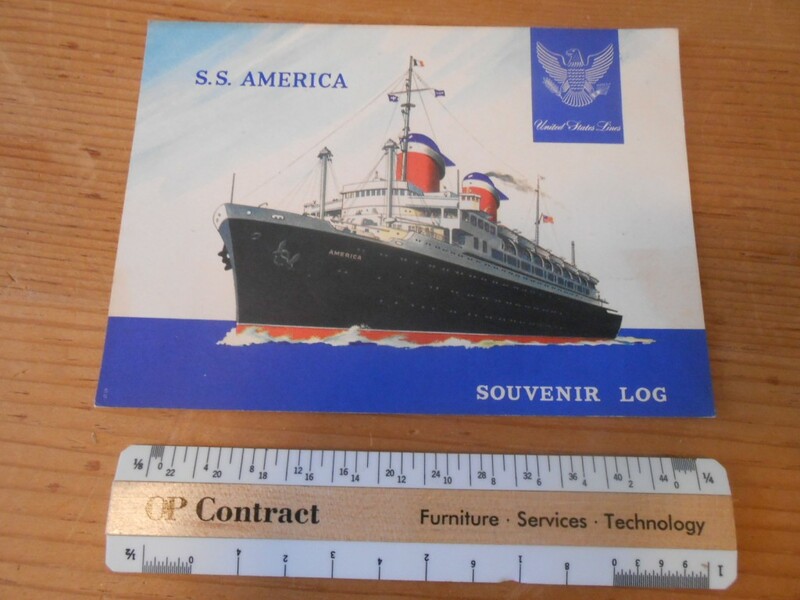 Lovely postcard for the lovely SS America. She was our leading lady until the Big U came on the scene in 1952. I have always liked the lovely Alyward image on the card. Great condition with some yellowing to the back. Great SS American card for her westbound voyage 184. Frederick Fender was in charge as the ship sailed from Bremerhaven onward to New York via Southampton, Le Harve and Cobh. She left on 10/ 23 and arrived in NYC 6 days later on 10/28. The card is in great shape with a little yellowing to the “statistics” side. 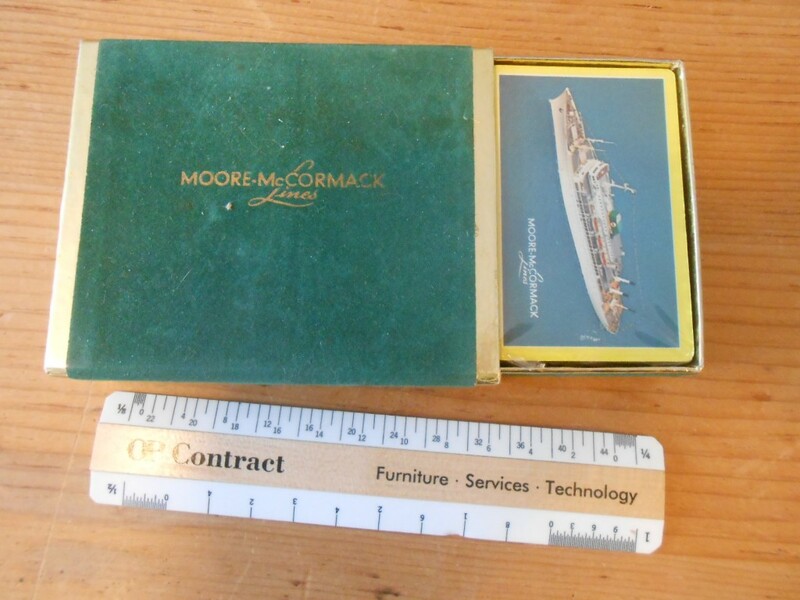 Excellent double deck of playing cards for Moore Mac’s last set of passenger twins. The box is green velvet trimmed and lettered with gold. These are in pristine condition and the cards are still sealed with plastic. Perfect! 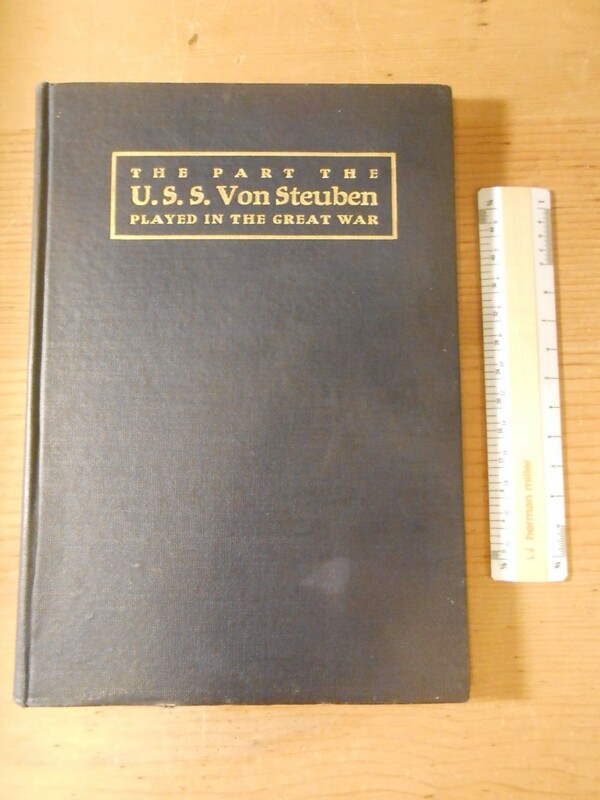 Wonderful book on the USS Von Steuben’s WW1 wartime service for the Stars and Stripes. She was built as NDL’s Kronprinz Wilhelm and at one time held the Blue Riband of the Atlantic. After the war, rumors abounded that she would be refurbished and used to show off America’s industrial might .. or even more service, but this was not the case and she was the first of the captured German four funneled liners to go to the breakers. Signed by the Author! 3 excellent breakfast menus for the darling little America. The are all in pristine shape and date from Dec 31, 1960 – Jan 2 1961! Happy New Years!!! .. I sure wish I could have been aboard! The selections were impeccable and I’m sure I would have gotten pretty fat! 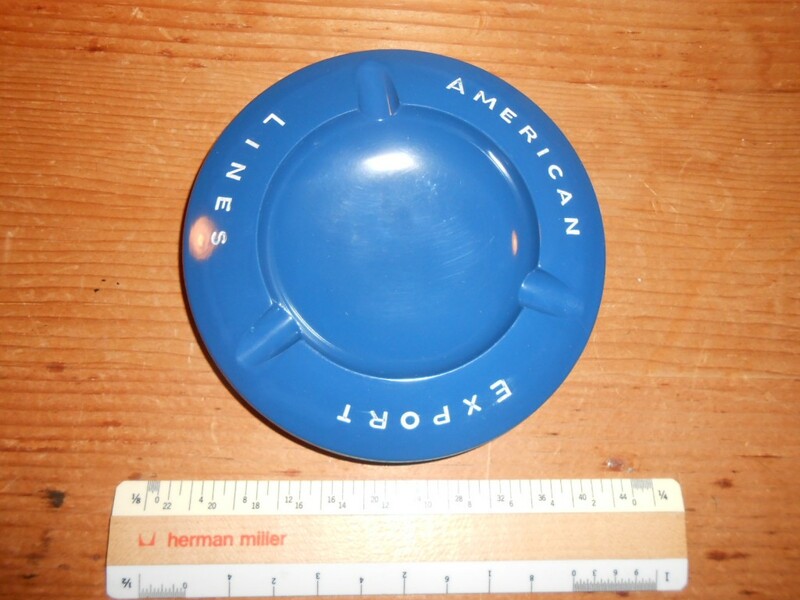 American Export Lines: Blue UFO ashtray restocked! 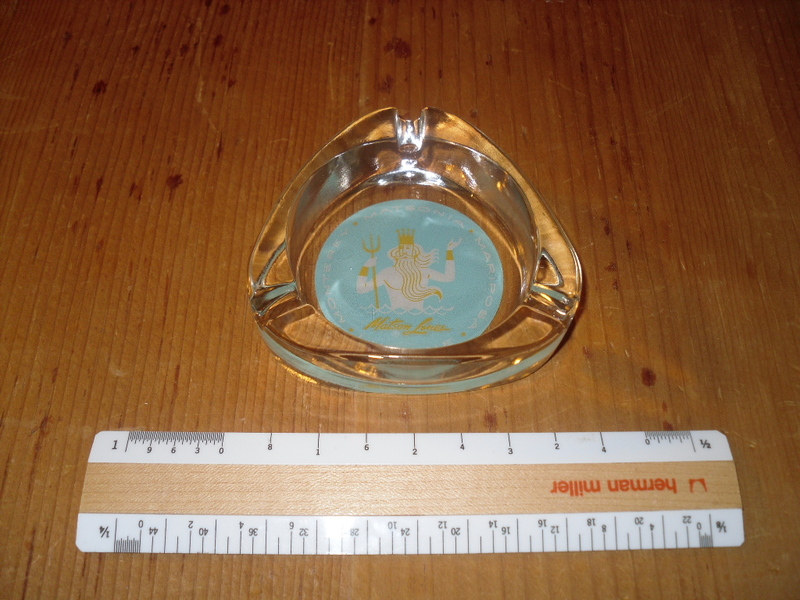 Great heavy flying saucer like ashtray. 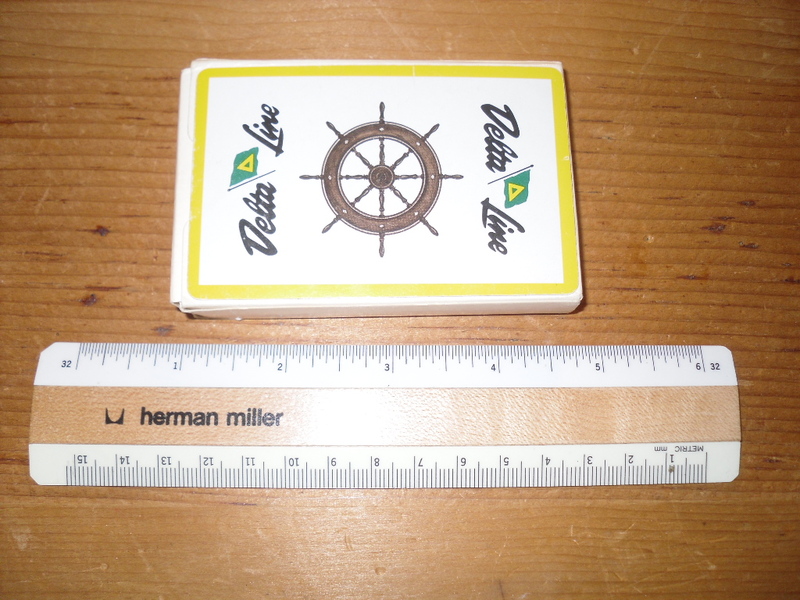 These would have been everywhere on board in the 50’s and 60’s … and became nice little souvenirs for passengers. In excellent shape! Somewhat rare for me to find APL items … so I am happy to have found this and offer it here!. This is a great plan for both ships that includes onboard pictures. There are a few added wrinkles along the fold lines … probably was folded incorrectly at some point. These 2 sisters were sturdy WW2 designed tonnage that was reworked into passenger service. 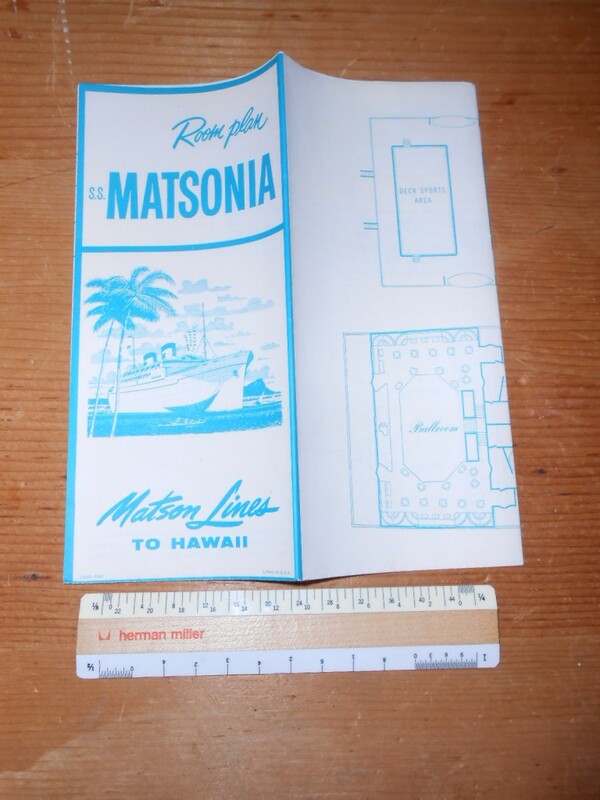 Superb little DP for the Matsonia liner printed on heavy tissue. Love the LANAI suite’s on these ships … almost like todays vessels with their private balconies. Matson always kept the White ships hulls pristine .. I bet the painting went on almost around the clock. 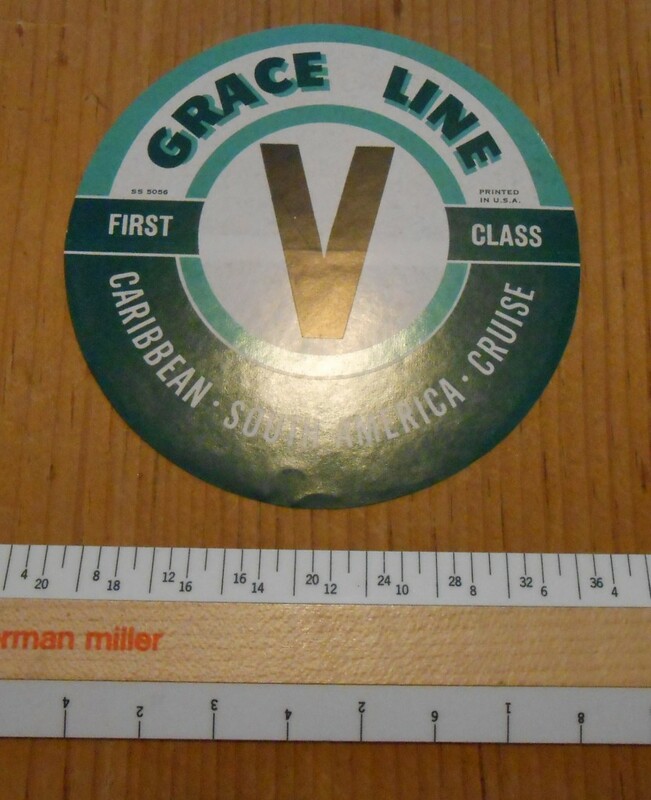 Lovely seafoam and teal “V” First Class baggage sticker for the Grace Line. Unused and in excellent shape. Stickers like this would have been on every travelers luggage.. sort of a badge of honor for the well traveled. 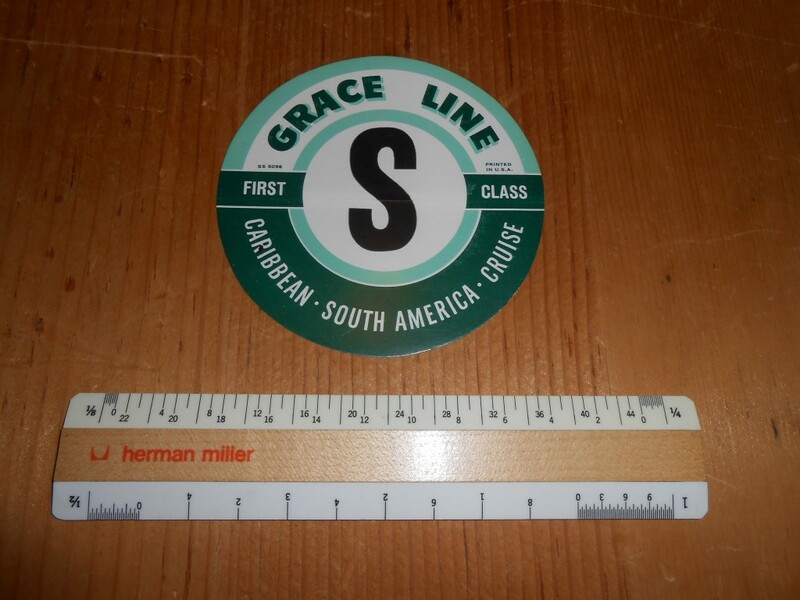 Lovely seafoam and teal “S” First Class baggage sticker for the Grace Line. Unused and in excellent shape .. these would have once adorned the luggage of the well traveled person. There was a nostalgic liner outcry in the late 70’s and 80’s … where did all the liners go? This plaque for the Oceanic Independence was done as part of a series of past liners to commerate the liners that were still with us. Though she was owned by CY Tung at the time, the Oceanic Indy started life as the Independence for American Export. She cracked in half upon reaching Alang for scrapping. The Ward Line’s Siboney actually served in both world wars … which sandwiched her peacetime service. This is a WW1 portrait of her dazzle painted and laden with lifesaving rafts. 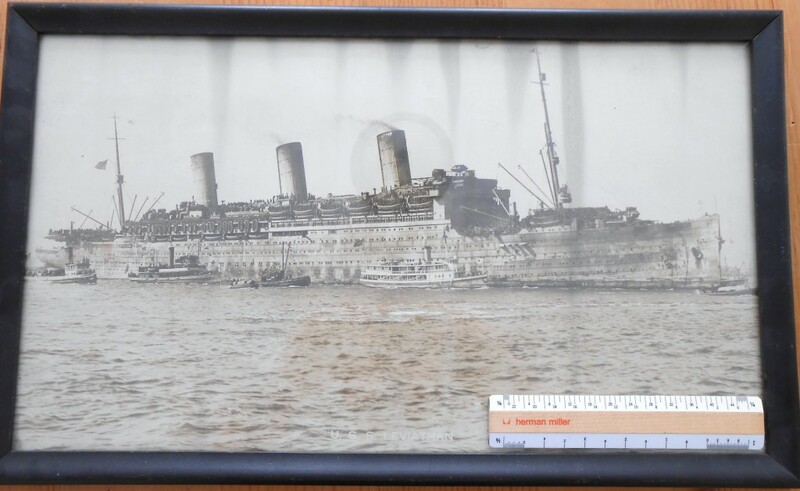 The portrait is in good shape for WW1 with a few waves, the black frame has the typical scuffs and scrapes. I may need to quote shipping for this. 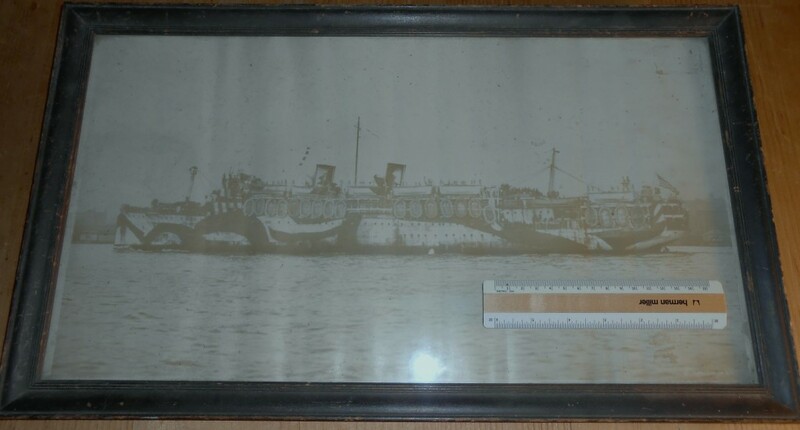 Alcoa Steamship Company. Alcoa Clipper Agency print. 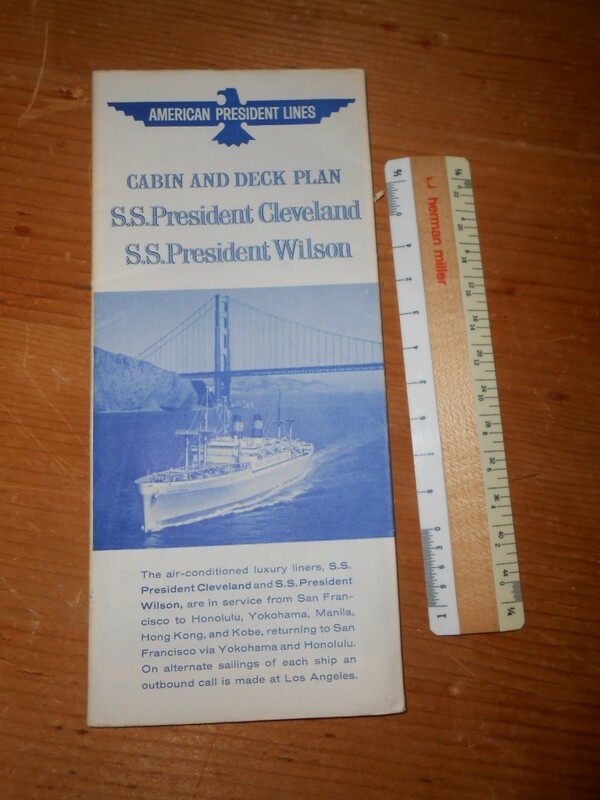 Matson Line: “prewar” brochure and 1941 rate/ sailing schedule. 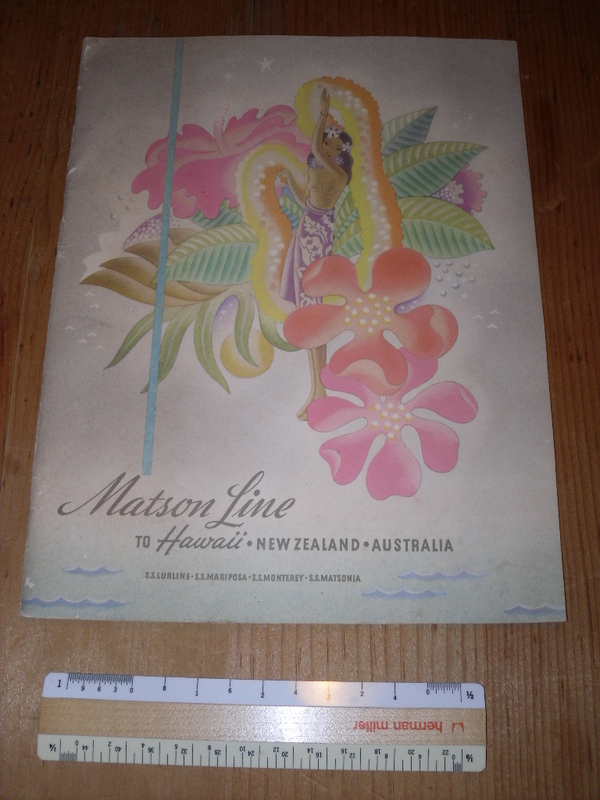 Just about the best interwar brochure Matson did …covers the Lurline, Matsonia, Monterey and Mariposa . Half of the pages have lavish large interior pics (some of the best interior pictures of these ships I have ever seen)… and the remaining pages talk about each destination (like Australia and New Zeeland). 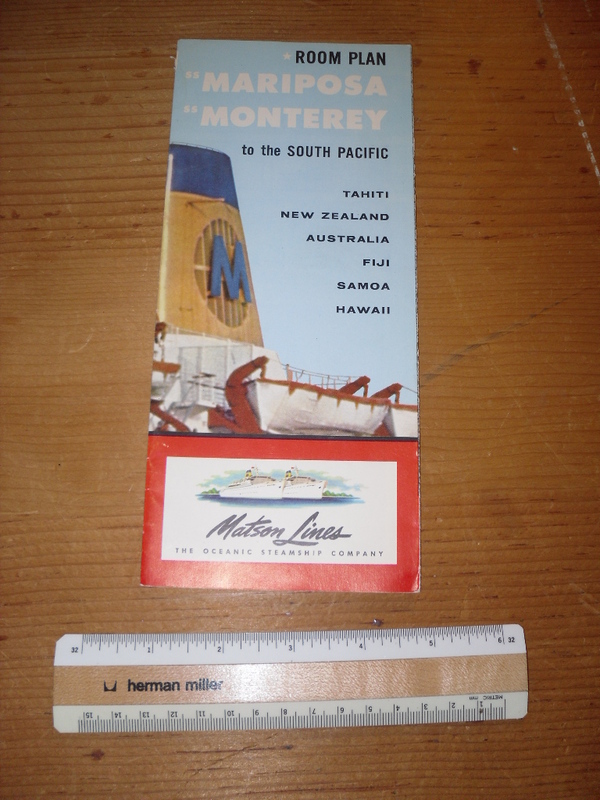 Also includes is a rate brochure for 1941 and a page of notes form a voyage. Good condition with a few cover blemishes. Lovely almost pristine pack of Playing cards for the delta line. 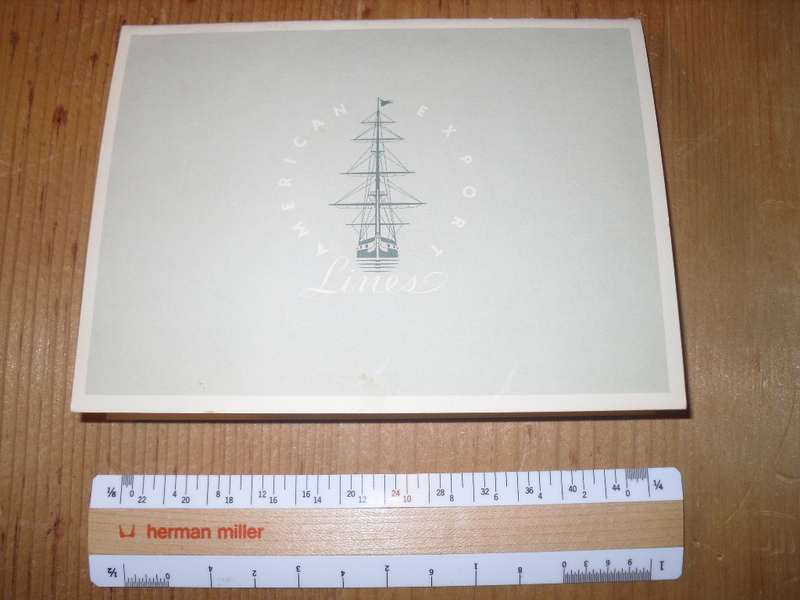 These ships plied the Caribbean … their major competitor being grace line ships. Loved their “sharp” post-war design. 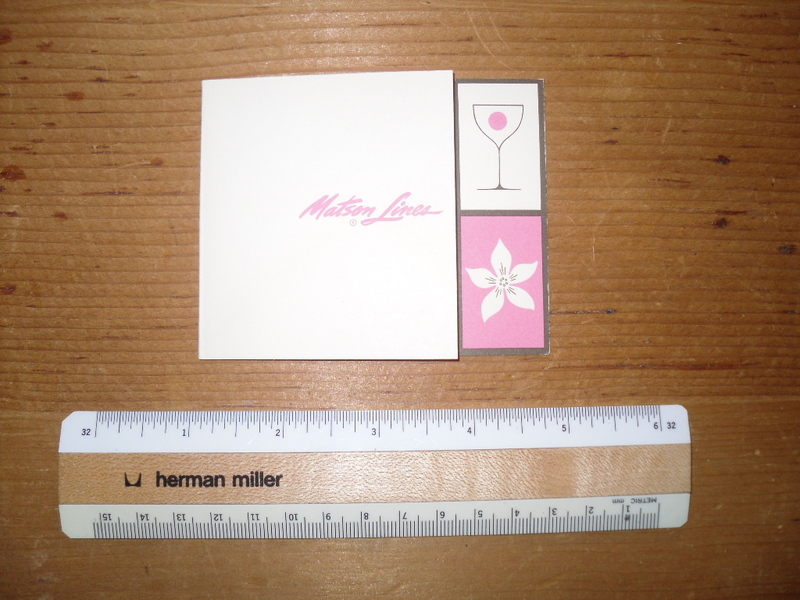 Nice little invite card for cocktails poolside from Captain Stein of the Monterey. This is pristine … looks like it was just signed by the captain himself yesterday. Matson Line: SS Monterey/Mariposa Room plan. Lovely little room/ deck plan for the last Matson passenger sisters. Love the little “Hawaiian” details in the room pictures …from the Theater tiki Lights to the fresh Amaryllis flowers in the cabin vases. These would have been darling little ships to travel on! Cute little invite card to join Captain Switzer in the Independence Lounge for cocktails. I wonder if Dr.amd Mrs Urbanwez went? I’m sure the champagne was free flowing! United States Lines! 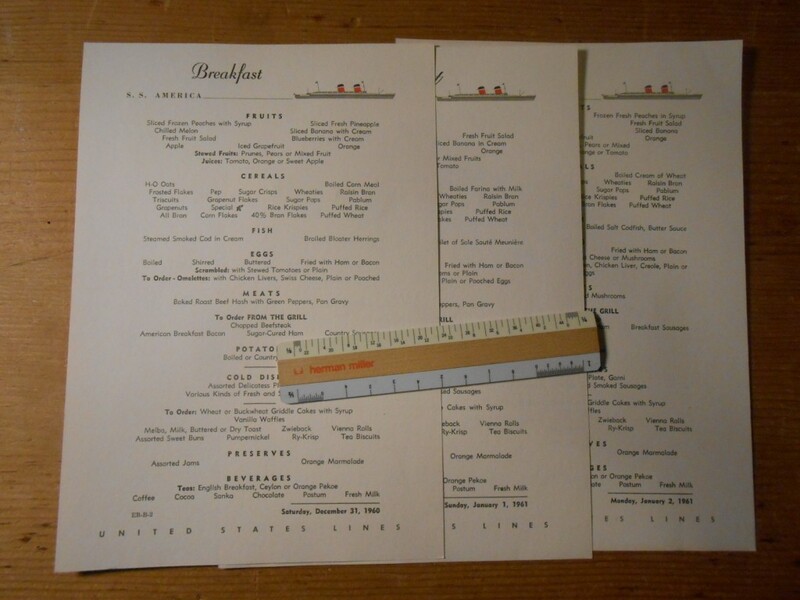 SS America 3 dinner menus! 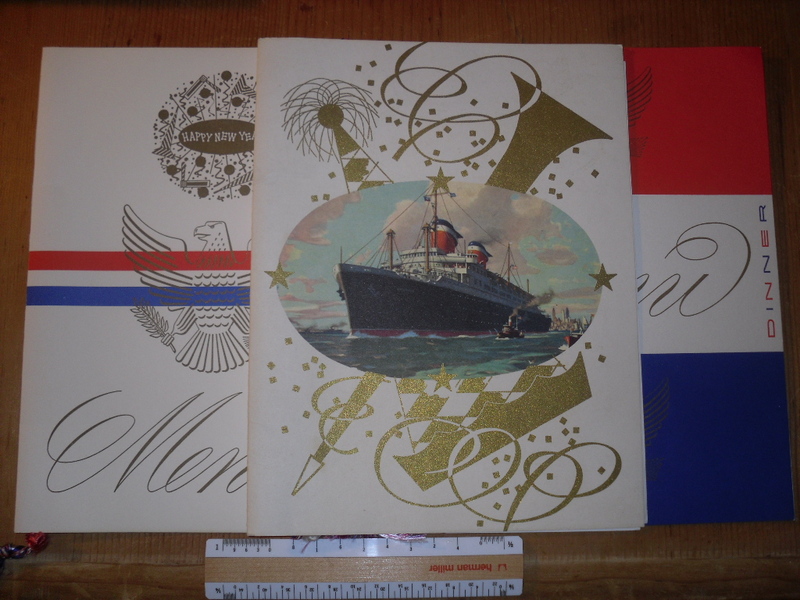 3 menus from a voyage over New Years in 1961 and Fred Fender was in charge. The dinner menus dates from Jan 1st, 2nd and 3rd. Full of lovely delicious items … I’d be even chunkier than now for sure. Great shape with a coulple of small spots from use and storage. Not bad for being almsot 51 years old. 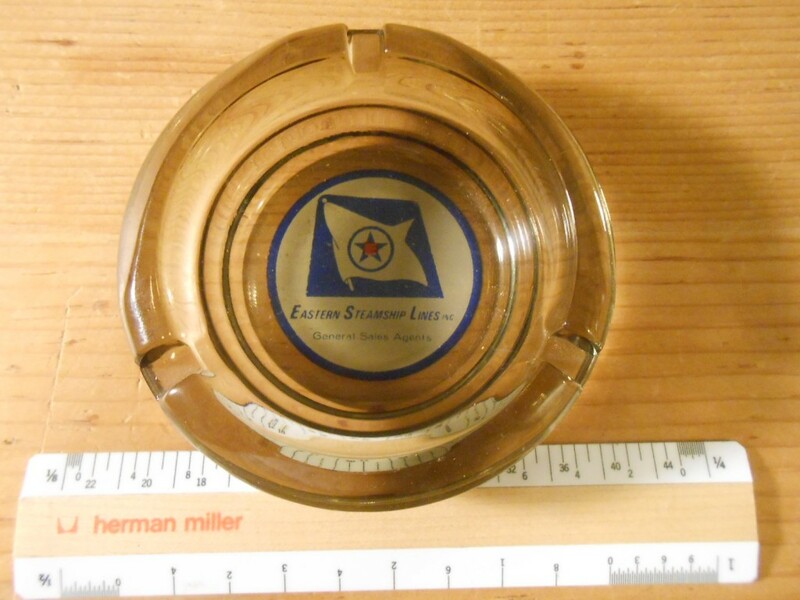 Perfect heavy glass ashtray for the Matson lines … these would not roll around too much during high seas. 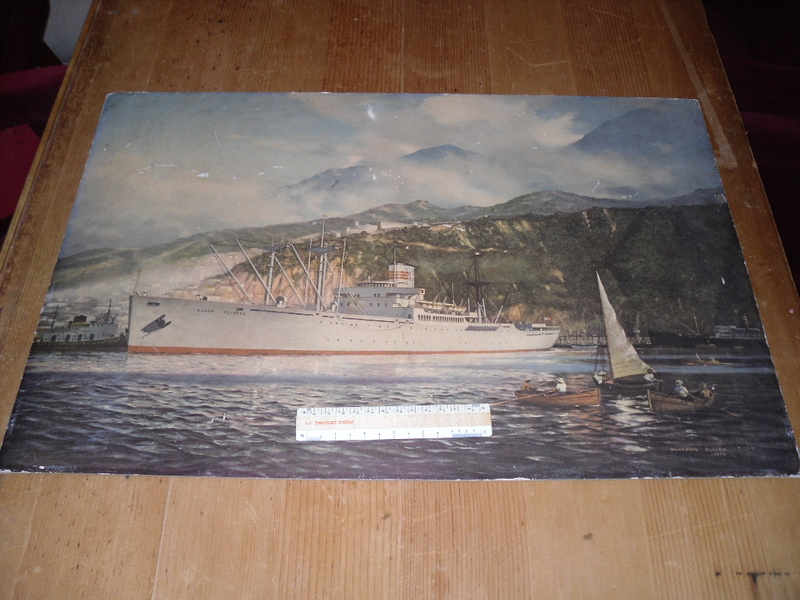 The BIG Matson white hulled passenger liners were popular in the late 20’s through the 60’s. 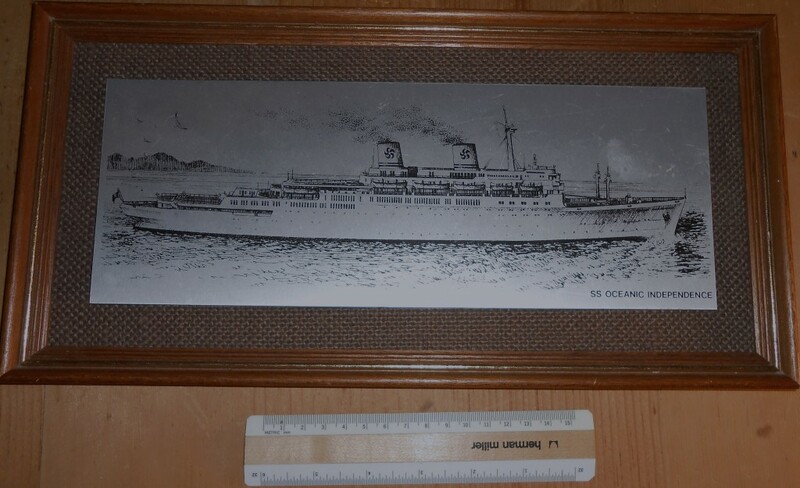 This is probably early 60’s mentions 4 ships Lurline, Mariposa, Matsonia and Monterey. Today, Matson lines concentrates on just container cargos and has no passenger operations. Mint: no chips or cracks! United States Lines: SSUS First Class Sports Deck Playroom chair Repriced and relisted! Oh to have been a child aboard the Big U … the whole ship certainly would have been a playground … but the children in all classes were pampered even further with their own playrooms! This is a lovely chair from the sports deck FC playroom. 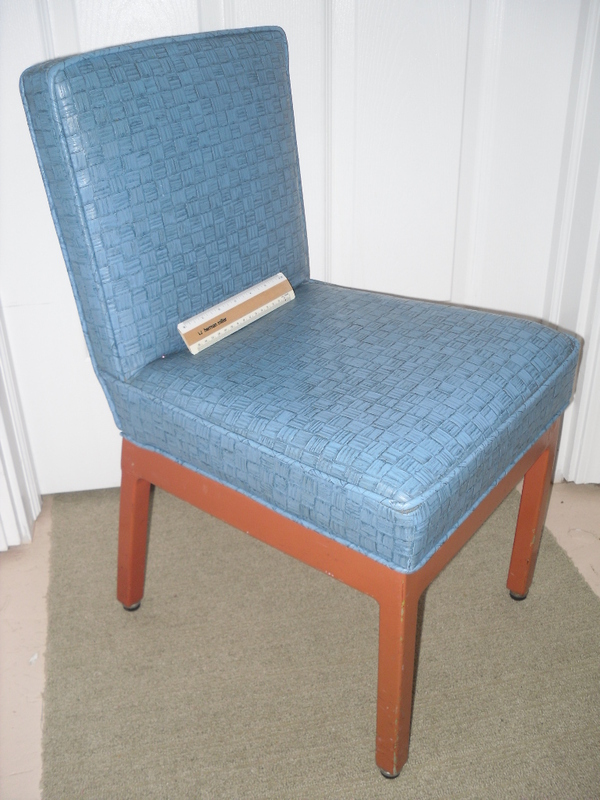 The “vinyl” blue seating upholstery is in excellent shape (one little seam seperation on a top corner) . .. and the red frame shows a few scratches and dingys: Overall it is a GEM! *** Shipping calculator probably will not be accurate for this item .. 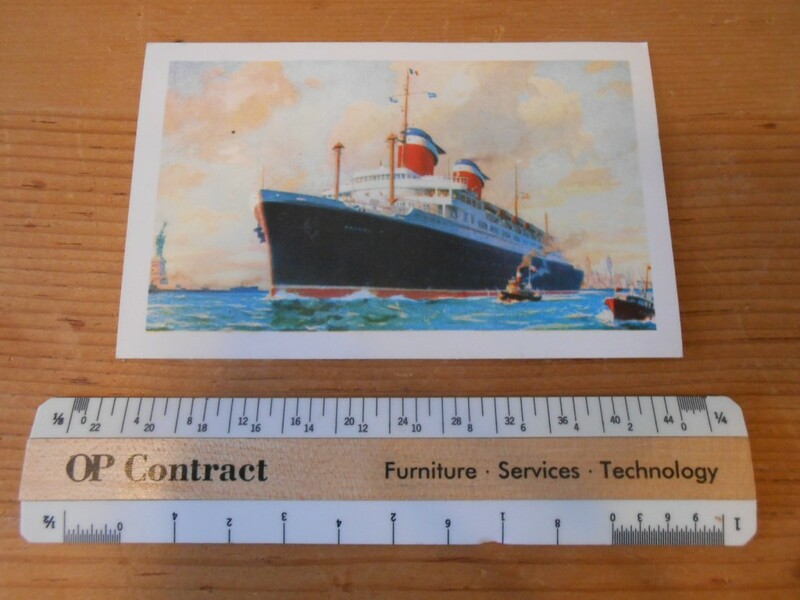 I will need to quote manually*** Please help save the SS United States, visit www.savetheunitedstates.org. PS: If any one has images and photo’s of this particular playroom … I’d love to see them. 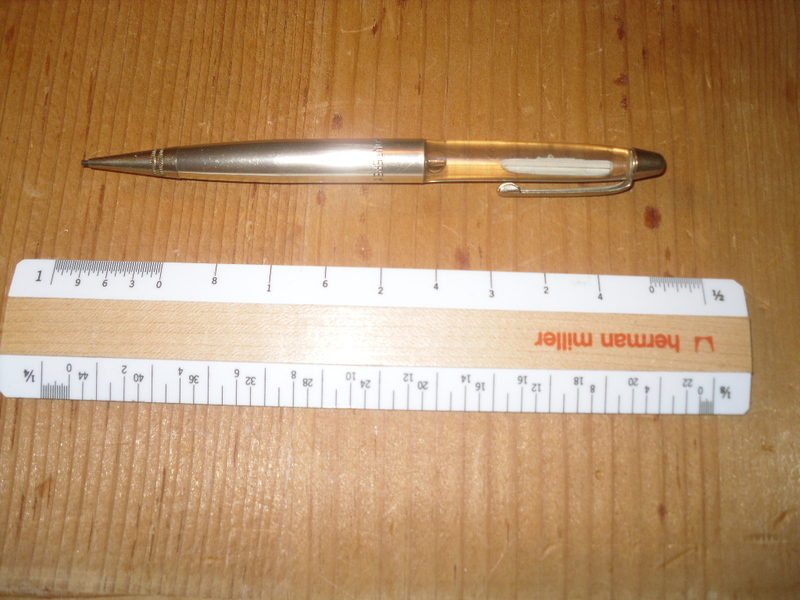 Can’t beat this floaty mechanical pencil for the Monterey … the little ship just bubbles up and down as you write. She and her sister were the last passenger liners for Matson … who to this day only concentrates on cargo. You’ll need to buy some lead! Stamped SS Monterey! 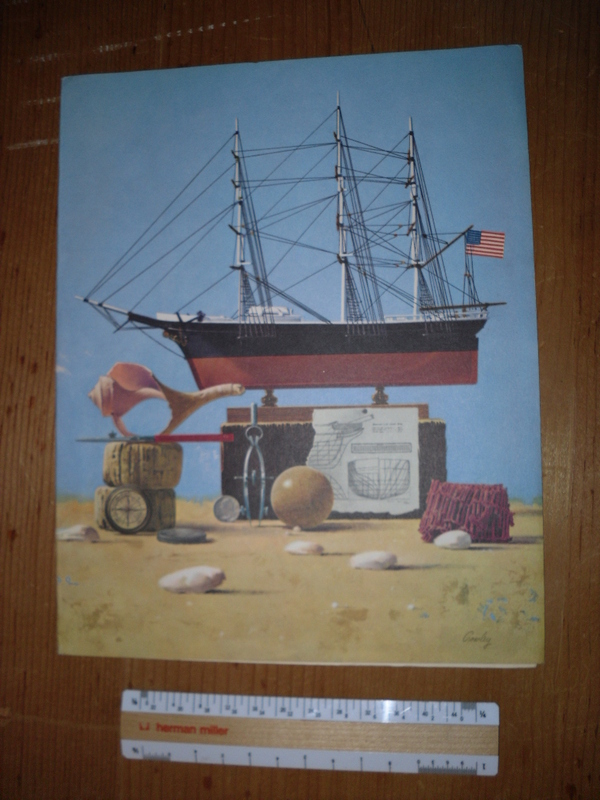 A nice president Cleveland menu with cover art designed by artist Don Crowley. Delicious assortment of food items would have greeted passengers for this meal … mmm, mmm good! Grab it … it is in excellent shape!